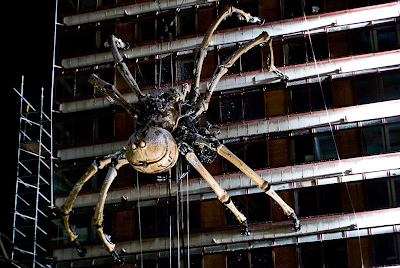 Eyeteeth: Incisive ideas: Giant arachnid scales Liverpool hotel! Giant arachnid scales Liverpool hotel! 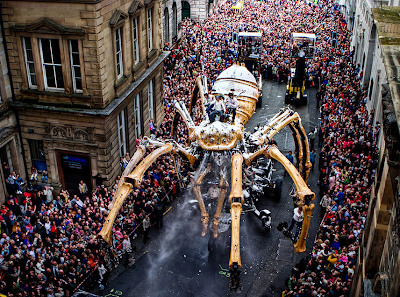 Yesterday's Big Picture ran an amazing set of photos by Pete Carr of La Machine's 2008 project in Liverpool in which the "French theatrical engineers" created a giant mechanical spider that prowled city streets and scaled the sides of buildings. (You may have seen news about company's "Sultan's Elephant" appearances in London in '06 and in '05 as part of a Jules Verne festival in Nantes). The photographer answers questions about the £1.8 million spectacle in comments at the Boston Globe. One of the many YouTube videos of the arachnid, "La Princesse."